A 2-month-old male infant was brought with fever and respiratory distress of 5-days duration. Investigations showed a round, radiopaque foreign body in the upper esophagus. The child was diagnosed to have coin ingestion and referred to our center for removal of the same. Careful review of the X-rays led us suspect button battery ingestion. Emergency rigid esophagoscopy and foreign body removal was performed under general endotracheal anesthesia. A rusted, 4 mm wide button battery was removed using optical forceps with difficulty. Postoperatively, the child was managed on a ventilator. He received supportive care. Check scopy done using ultrathin, flexible esophagoscope on day 10 showed acquired tracheoesophageal fistula. The child underwent defunctioning gastrostomy and feeding jejunostomy, but succumbed to sepsis from mediastinitis and recurrent pneumonitis 2 days later. 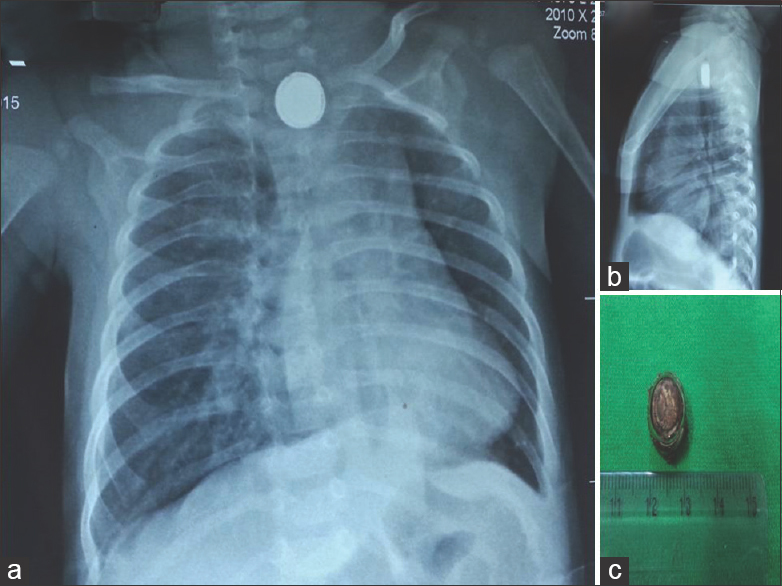 Ingestion and impaction of the button battery in a 2-month-old infant are extremely rare and unreported in literature. Hence, the case report. Gastrointestinal injuries secondary to button battery ingestions in children have emerged as a dangerous and difficult management problem. Batteries that pass beyond esophagus pass down without causing significant damage. However, batteries that lodge in the esophagus can lead to serious complications including death, especially in young infants and neonates. The scenario is further complicated by the fact that sometimes, children with button battery impaction present with nonspecific symptoms such as fever, respiratory distress, decreased feeding, excessive salivation and lethargy resulting in delay in diagnosis, and medical care. To prevent such life-threatening complications, there is a need to create increased awareness among parents and health-care workers about health hazards of button battery ingestion. A 2-month-old, healthy, second-born male child, weighing 4.4 Kg was brought with fever and respiratory distress of 5-day's duration.He was irritable and did not accept breastfeeds. There was no history of sudden choking. There was history of purchasing an electronic toy for 3-year-old elder sibling recently. The child was admitted in a private hospital where he was diagnosed to have coin ingestion and referred to our center, a tertiary care hospital, for removal of the same. On examination, he had nasal flaring with substernal and intercostal retraction. He was diaphoretic and tachypnoeic. The respiratory rate was 80/min. Chest X-ray showed a round, radiopaque object suggestive of a metallic foreign body at the level of T1 [Figure 1]a. The lateral chest X-ray showed a thick, radiopaque foreign body occupying almost the entire esophageal lumen and compressing upon the trachea [Figure 1]b. On careful assessment, “halo sign” was appreciated [Figure 1]a. The child was taken up for emergency esophagoscopy. He was intubated using No. 3 Portex endotracheal tube. Rigid esophagoscopy was performed using 4.5 rigid esophagoscope under general endotracheal anesthesia. There was pooling of secretions in the throat and upper esophagus. A rusted, 10 mm sized, 4 mm wide button battery [Figure 1]c was removed using optical forceps with difficulty. There were blackish-green discoloration and charring of the esophageal mucosa with a lot of inflammation. Detailed check scopy of mid- and distal esophagus was not possible. Hence, procedure was abandoned. At the end of the procedure, we planned to keep a nasogastric tube in situ. However, infant feeding tube could not be negotiated into the stomach. The child was shifted on ventilator in view of prevailing respiratory distress. He was kept nil by mouth and received intravenous Vancomycin, Meropenem, and Steroids postoperatively. He was extubated on day 3 of scopy. He maintained the oxygen saturation, and there was no tachypnea. Check scopy done using ultrathin, flexible gastroduodenoscope 5 days later showed large tracheoesophageal fistula (TEF) just below the cricopharynx [Figure 2]. The esophageal opening could not be identified separately on this scopy. Two days later, his upper abdomen appeared distended causing diaphragmatic splinting and further respiratory compromise. Hence, he was reintubated and put on ventilator. A deflating gastrostomy and feeding jejunostomy were done. However, the child developed bile reflux and succumbed to sepsis on day 15. Ingestion of button batteries by children has increased in recent years, probably due to the increasing accessibility of electronic toys and devices to children. Button batteries as foreign bodies are unique since battery ingestion-related injury results from direct pressure necrosis as well as local electrical currents and alkali leakage., Due to their electrochemical composition, impacted batteries in the esophagus cause extensive damage. Battery impactions are reported to result in erosive esophagitis, perforation, TEF, esophageal strictures, spondylodiscitis, vocal cord paralysis due to paralysis of recurrent laryngeal nerve, or aortoesophageal fistulas., Signs and symptoms are related to duration of impaction, size and contents of battery, motility of esophagus, and most importantly age and weight of the patient. Younger the child, more extensive is the damage. Urgent endoscopic examination and removal of foreign body along with assessment of esophageal damage are the primary modalities of treatment. Postoperative medical therapy involves rest to the esophagus (fasting), administration of intravenous antibiotics, antacids, and steroids. Repeat scopy in early follow-up period helps to assess esophageal damage better. It can detect extent of esophageal injury, evidence of perforation, and/or TEF  and can guide further management. There is no rule of thumb, and surgical management should be tailored to suit each individual patient. There are very few reports of successful salvage of neonates and infants with impacted button batteries. Raboei et al. have described the management of button battery stricture in a 22-day-old neonate. Russell et al. present an account of a 15-month-old boy with acquired TEF secondary to ingestion of 20 mm button battery lodged at the level of the carina. Here, the fistula was managed conservatively and healing monitored by regular imaging. Our case, a 2-month-old infant presented after 5 days of button battery ingestion. The foreign body had got impacted in the postcricoid region, site of anatomical constriction in the esophagus, and had caused extensive tracheoesophageal damage. Because of prolonged impaction and surrounding tissue damage, it could be removed with difficulty. Missed initial diagnosis had lead to mediastinitis, pneumonitis, and severe respiratory compromise. Continued electrochemical damage resulted in an acquired TEF in the postcricoid region, much higher to the level of the carina, and the child could not be salvaged. Since the management of children with button battery ingestion is a costly affair associated with unpredictability and high morbidity, there is increased need to educate parents about the dangers of battery ingestion and aim primary prevention. Health-care personnel should be aware of various modes of the presentation of children with battery ingestion. One has to be on high alert, especially in infants with nonspecific respiratory symptoms and suspect button battery ingestion early. It is very much important, especially when the child fails to respond to the treatment of respiratory infections. A plain radiograph of the chest can be of immense help in establishing the diagnosis. A multidisciplinary team approach and early referral to a Pediatric/ENT surgeon with rapid and coordinated care are of paramount importance to minimize the risk of complications and negative outcome. Yardeni D, Yardeni H, Coran AG, Golladay ES. Severe esophageal damage due to button battery ingestion: Can it be prevented? Pediatr Surg Int 2004;20:496-501. Ettyreddy AR, Georg MW, Chi DH, Gaines BA, Simons JP. Button battery injuries in the pediatric aerodigestive tract. Ear Nose Throat J 2015;94:486-93. Marom T, Goldfarb A, Russo E, Roth Y. Battery ingestion in children. Int J Pediatr Otorhinolaryngol 2010;74:849-54. Samad L, Ali M, Ramzi H. Button battery ingestion: Hazards of esophageal impaction. J Pediatr Surg 1999;34:1527-31. Russell RT, Cohen M, Billmire DF. Tracheoesophageal fistula following button battery ingestion: Successful non-operative management. J Pediatr Surg 2013;48:441-4. Raboei EH, Syed SS, Maghrabi M, El Beely S. Management of button battery stricture in 22-day-old neonate. Eur J Pediatr Surg 2009;19:130-1.